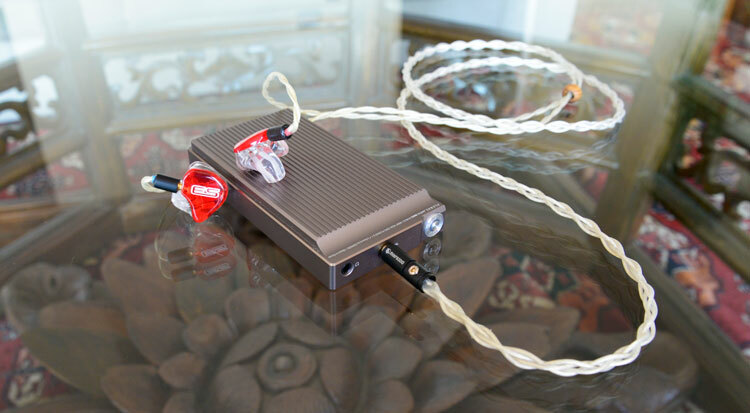 I wrote my first review ever for the EarSonics Velvet. Fueled by enthusiasm, and undeterred by the lack of any knowledge or background whatsoever in analytical listening, I reported my experience with the Velvet. I waited patiently for any comments or likes. Then I waited some more. It was only much later I realized that simply saying ‘everything is awesome!’ and ‘the Velvet is very energetic! !’ wasn’t as helpful a description of its signature and capabilities as I had envisioned. Even though I couldn’t describe its characteristics in proper terminology at the time, I was right about one thing: the Velvet’s essence lies in its dynamic presentation; a quality connected to its signature, but also transcending a frequency graph. 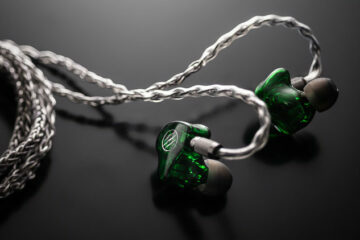 The Velvet was derived from the EM32; up until the recently launched S-EM9 EarSonics’ flagship iem, and still the flagship of their custom monitors targeted at musicians. When asked, Frank Lopez – EarSonics’ CEO and lead designer – confirmed that the EM32 was intentionally designed to sound dynamic across all frequencies, with only a slight U-shape based on the extra sub-bass response and treble extension. I’ve been a fan of the EarSonics house sound ever since the Velvet. It shares a great deal of DNA with the EM32: 3 BA drivers and a passive 3-way crossover system. I still have the enthusiasm of my first review, but I feel I’m getting another shot at the phrasing this time. For the EM32 and Velvet have a somewhat similar U-shaped signature, but in the end, they’re more different than I expected – not in the last part due to the fact that the EM32 was designed for musicians and the Velvet for a larger audiophile audience. The EM32 has a more neutral tuning, but also a more ‘raw’ sense of power. The Velvet, on the other hand, is a bit smoother, and more forgiving for bad recordings. Opening the FedEx package was an instant reminder that the EM32 is designed for musicians. I was expecting the classic matte black box that I’d grown accustomed to after receiving the Velvet, S-EM6, and S-EM9, so the small plastic box shaped like a briefcase was a bit of a surprise. But this is a case that’s designed to carry with you on tour. It’s lined with soft protective foam and consists of 3 separate areas for the monitor, cable, and cleaning tool. The case is built from hard black plastic and comes with your name engraved on the top. Besides the standard cleaning tool, there are no surprises. The EM32 is a 3 BA driver with a 3-way passive crossover. The bass and mids are produced by two bigger drivers, with a small treble driver adjacent to the other two. The canal is fit with two sound bores; from the looks I’m guessing the bass and mid drivers together in one and the treble in the second. 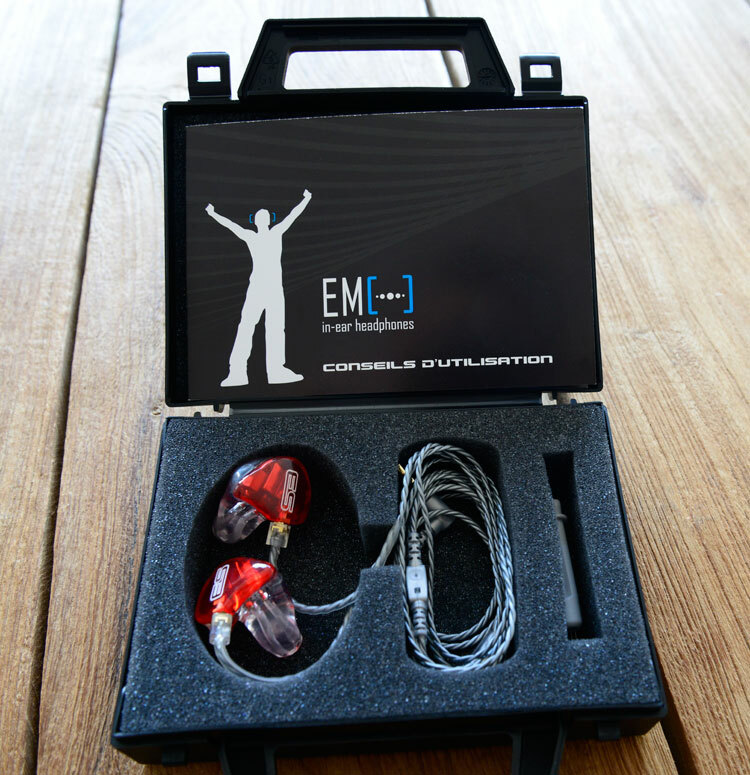 EarSonics has their roots in supplying monitors for musicians, and their custom monitors are still targeted first and foremost at them. This is visible in the design options; while there are 18 different color options for the faceplate, there aren’t any fancier wood, carbon or pearl options like we’ve seen become more popular for personal customization. While this is a growing trend in the audiophile market, this is less the case for musicians that view their monitor primarily as a tool. While the EM32 ‘only’ has 3 drivers, it’s still a full sized custom due to the size of the drivers and crossover. The monitor protrudes the inner ear, but not yet the outer ear. I’d say it has a medium size for a custom, slightly bigger than what I was expecting for the 3 drivers but not large overall. The EM32’s nozzle goes quite deep, a tad deeper than my other customs and gives a very snug fit, and one of the tighter fits of my customs without being uncomfortable. The sound isolation is very good – probably the best I have. Sometimes when I need to focus at work I’ll keep them in my ear without music playing, especially when one of my colleagues goes on a typing frenzy, or they start to get chatty (I share a space with 4 female colleagues) – it’s incredible how much of the sound gets blocked out. In all their wisdom, EarSonics saw it fit to make the left canal longer than the right, a few mm at least (think about 3 or 4). So I felt the difference in insertion depth at first, but it doesn’t affect the sound and after a while I got used to it. All of EarSonics iems come with the same generic 3-wire cable in either gray or black (in this case gray), with transparent memory wire. The EM32 first came with a standard 2-pin connection, but EarSonics recently switched to mmcx for the EM32 and later S-EM9. In terms of ergonomics, the cable is pretty good, being lightweight and relatively tangle-free, but I personally much prefer an aftermarket cable for the Velvet or EM32. The monitors seem to open up a bit more with a quality cable, as if the sound is just a bit restricted at first. 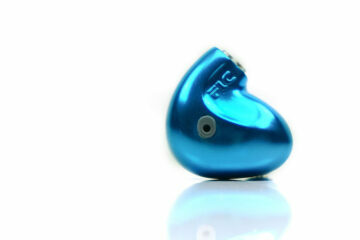 The treble energy improves, as well as the mid-bass control, lifting a bit of the proverbial veil off the midrange. The cleaner atmosphere benefits its general instrument definition and separation. Thanks for the review! I have had Velvet for couple years before it got stolen couple months ago. I always had it in highest bass setting. Do you think EM32s are going to be less bassy compared to Velvets in the highest bass setting? Hi aras87, the Velvet is a long time favourite of mine. The Velvet gets its bass punch primarily from the mid-bass, especially in the warm setting. So in overall quantity, the EM32 will not have more. But it’s a different type of bass, the EM32 has more of a hard-hitting, punchy bass compared to the Velvet. They also have differences in their signature, with the most important being in the midrange; the EM32 has a fuller midrange while the Velvet is clearly more V-shaped; but the Velvet is smoother. I prefer the Velvet for EDM and pop music, but the EM32 for instrument-based music due to the midrange tuning.